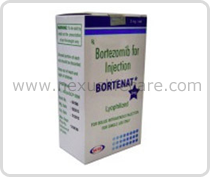 Uses:- Bortenat Injection is the first therapeutic inhibitor to be tested in humans. Bortenat Injection is approved in the U.S for treating multiple and mantle cell lymphoma. Side Effects:- Peripheral neuropathy, myelo suppression, high rate of shingles.Gastro-intestinal disturbances and asthenia.